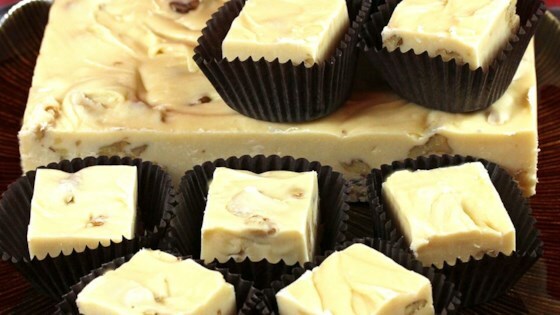 "Sugar and evaporated milk are boiled then combined with mini marshmallows, white chocolate chips, walnuts and maple flavoring in this fudge that is chilled overnight before serving." In a medium saucepan over medium heat, combine sugar, evaporated milk and butter. Bring to a boil and let roll 5 minutes. Remove from heat and quickly stir in marshmallows, white chocolate, chopped walnuts and maple flavoring. Spread in a 9x13 inch dish. Top with large walnut pieces, evenly spaced. Chill 8 hours or overnight. To serve, cut around large walnuts. Maple syrup and walnuts create an amazing cranberry sauce. I thought this was very good fudge. It set up well for me. It had a good texture and cut nicely. Now one of my favorites. Made this without walnuts and it came out superbly smooth and rich. Very easy to make. Will try the next batch with the walnuts.